Google appears to have soft launched this site for Google Chrome, its open source browser, which is slated for release on Windows tomorrow. This post was originally posted by our content partner Techcrunch. It has been republished with permision. I’m sure this will get a lot of press and a lot of people trying out Google’s new browser. They’ll probably still sponsor FF. And I predict that they’ll merge the two browsers together sooner or later. that is still to be decided. Google is taking over the internet world! If i could bet on one thing, the new browser should be verrrrrry powerful. However, I don’t think it will become an opera killer, since I can access just about anything google with my default. Should be interesting. Great find shoe! I think traditional browsers stand any competition. Well the cats out the bag now. More like generating buzz… now people want to know more but they can’t get more! Jim’s right… I’m all hyped up about it now and can’t wait to download it! it’s some kind of marketing they are doing now. link’s working fine for me. Wow, expected but still caught me by suprise, at least this is good: “we are making all of our code open source as well”. Windows only (for now), might be my first reason to try boot camp hehe. I can’t wait too try this out tomorrow! It looks really nice. And anything by Google is gold. Me thinks Firefox has some competition. I wonder if it’s possible to crash googles servers if enough people are downloading like firefox download day, most likely not but anythings possible. I think they have plenty of serves! yes, it would be pretty hard for Chrome to outrank Firefox with his first version. But, never say never, we’ll have to wait and see. I think the quality Chrome will understand immediately. Can’t wait for the release. But maybe I should wait and see so that all the bugs get fixed after the first release. I’m too anxious to see what they did to wait until all bugs gets fixed. Google just stabbed Firefox creators in the back. I guess no more funding. i think google can handle both together! What if these two will merge together in the future ? Or, this one could finally became a serious competitor to Firefox. i second that.. but I am sure goog wil adhere to the standards. I will go ahead and third that. it hope their apps still work cross browser. Interesting. Their newsletter today talked about new features in Google maps. How long before this turns into a person web OS? It will not matter soon what computer you are on. 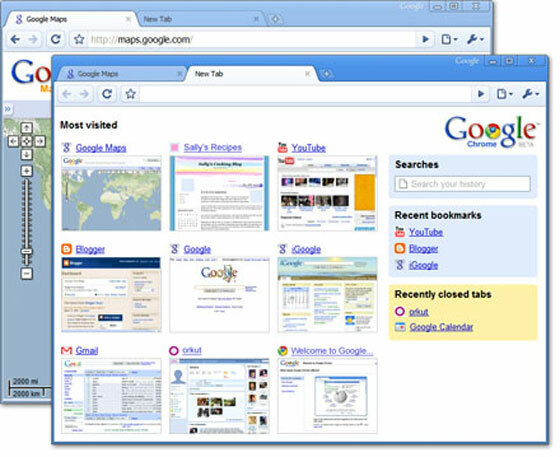 All you will need is the Google web browser and you will be able to do everything you need. This is a controversial question. I am not sure that everything is so good and easy. Yip thats exactly were they are going with this, its brilliant and there will be a solution for the OS in the time to come. That is what I was wondering. Seems they will have more control over the sites if they own the browser… It could be good for end users though. I don’t want ads on everything though. Ahh yes, Google Chrome! Of course. Cool, shoe I just wanted to tell you that your blog theme is looking messed up and images are over riding the text in sidebar! EDIT: OK, its fixed now, thank god! How can Firefox develop when GG bringing us their own browser? This is Google we are talking about, they can do anything they wish and the benefit to them is having all the apps nicely packaged into the browser it makes perfect sense now that it is out or on the cards. sweeet! can’t wait. i love how google sponsors initiatives like this, i think it fosters competition and results in cooler products for us. This is a great advancement for Google in their ever growing field but I honestly believe that Mozilla’s Firefox will never be beat out. Sure it has it’s up and downs but I guess we can’t say for sure until it’s actually released. Also Gossip, this is what will encourage further development of Firefox, because competition only leaves room for improvement and further advancement. To Mozilla, they only see this as a chance to better their service and to beat out Google. One thing Google learned early is to not play around, go for the jugular and finish the job fast. This could very well be the fatality for Microsoft if this pans out to be as big as everything else that google has done to date. I agree that Google makes good things. However, I think that the browser can get not a good. I wonder how many people went to GoDaddy first to see if googlechrome.com was available? That must be interesting. Currently, the link is down though. Google wants to take over the world, I tell you! As I see they manage their company damn well so that shouldn’t be a negative perspective. I want to see how this new tool works, the Google dominates! Maybe it’s a play on words? Chrome is going to be the “peak” of all browsers. Looks like the soft launch page and everything else related to Chrome has been pulled, seems odd considering the effort they went thru to get exposure. Chrome looks like it will have some great security measures in place (sandbox isolation of processes). It’s user interface could be an improvement too (but Firefox is already so easy and intuitive). I can’t wait to try it out. This is definitely going to be huge. Google does it again by taking something we take for granted and improving it many times over! This is awesome but will it render as beautifully as Safari? Yippppeeee…. just one more web browser for web designers to design for, how fun for them. Google usually simplifies a process so I am excited to see how this idea turns out. google messing with web standards in their new browser is a nightmare I don’t want to dream. Not sure if I am going to try this out. I love everything Google but I really like my IE7. I know I know. I should use Firefox. Installed pretty quickly, looks great and first thoughts so far is that it’s pretty good. I really like the “Inspect Element” freature when you right click on the page, it’s handy when you are debugging and need to do find something in a huge page. Incognito mode (basically stealth mode, i know ie8 now has it this). Taskbar manager with the nerd mode (memory break down including other running browsers). I’ve got to say, for a new release it seems to offer some very nice features, that i’ve personally not found in other browsers, i’ve not looked, so they may be in there somewhere. Agreed. Very slick for a first release. I’m impressed with the speed most of all. Page loads seem to be much better w/ this vs. opera or ff. As far as I’ve seen, it hasn’t broken any of my sites. Woohoo! it’s at least moderately standards compliant. I’m not raring to try it out. I doubt it’ll do anything to fill the space that Firefox occupies in my heart. I’ve not got around to upgrading to IE8 as you can see. Google is the Darkside, they want to take over the galaxy! I just don’t see myself downloading another browser!! I am going to stick to firefox for now. I just don’t feel like changing up browsers on release because I have bad memories switching over to Vista so quickly. Chrome will be most used browser within 2 years lol google are taking over the net. Saw your post once I got net-connected. Did you know that Google just broke The Firefox SEO ranking capabilities? In fact none of my ranking tools are working for Google. Evidently, Google wants it’s social networking plans to include not only your YouTube habits, but also they want to target ads based on the social sites you visit… hmmm another pre-Christmas Google-slap to the Affiliates out there? “It seems like Google implemented a feature (which is transparent to searchers) but really messes up tools that are used to check your rankings in Google. “WebPosition Gold, as well as other ranking report tools (scraper based tools – including the SEO Firefox plugin) have been impacted. Google does not want us to know HOW their social features affect search rankings. Why? Because they WILL be the basis for their new search algorithms. Google is already integrating your Google profile with local search. Google is already integrating YouTube with your Google profile. We already know that Google has integrated your Google Reader, Gmail, a Friends list and your profile. Google will know everything about us, what we like and be able to deliver bullseye advertising everytime. What is in this for you and me? The greatest viral marketing engine on the planet and just by using it you will build advantage on your competition. Downloaded it, installed it. pretty slick, nice and quick, really clean..
I’m using Chrome as we speak. It’s already better than FF. It’s quicker, smoother, everything seems to load fluid… great browser. Also, the simplicity and look I think will be it’s biggest asset, like Google’s search engine; the look of simplicity allows them to dominate I think, people like simplicity. This browser is class. Already has a 3 – 7 percent share. Goes to show how influential a link on Google.com is. I started using Google Chrome today.. so far – amazing. I love it. It’s really fast, that’s for sure. Pretty much the only upside right now. Jeremy, Chrome looks like a great way to extend the indexing of web surfers / users like Google Desktop did. I LOVE it, soo much faster than either IE or firefox! I have been playing around with a browser called Flock (flock.com). It is supposed to make it easier to add things to your blog if you find something interesting on a site you want to include. I would be interested in other people’s opinions on this browser and if it is really useful or not. It seems that many browsers are created equal as far as what they can do but for some reason I have a problem with IE just closing itself without warning and it is based on some plug-in that is installed. I read that Flash is giving more browsers problems these days. Maybe the Google browser will solve this? Google of the early 2000’s is much like Microsoft in the 1990’s getting a complete monopoly in the internet market. I wonder which company will be the leading internet tech player of the 2010’s..
it will be awhile before google chrome can take over , personally I use both firefox and IE , IE is for everyday browsing it’s just much more efficient and works a lot faster in my computer than firefox.. I use firefox and I like it mainly because of the add-ons. i really like chrome…the problem….it still doesn’t work for mac. the other commenter was right that windows still dominates but google has the resources to put teams on this thing. well, it seems that that way. Luckly i have parallels. But since Google is trying to be innovative why not start with mac first? if it is a difficulty issue then once the mac version is available then the pc side will come through pretty quickly. really great!!! Also waiting for Chrome os!! !